Taking the wilderness of our backyard, and putting it in a bottle. Part 1 of 2. 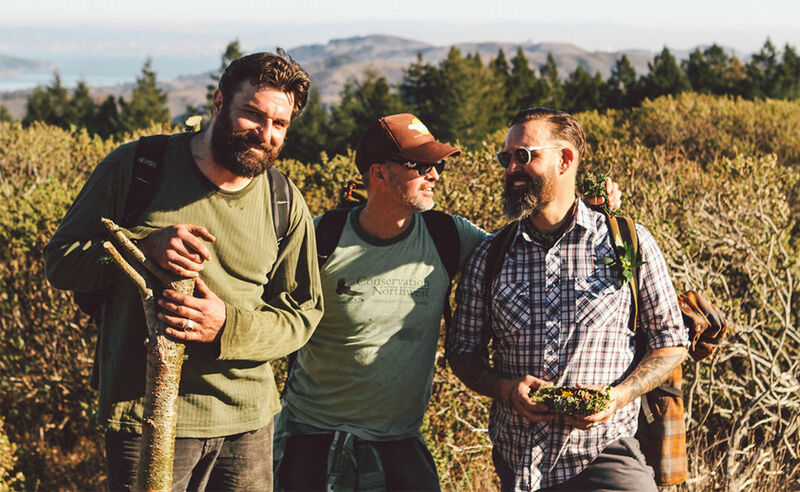 Mid-winter we headed up the coast to the impeccable wilderness of Mount Tamalpias to meet with our friends, the rugged wilderness perfumers of Juniper Ridge. We spent two days hiking off-trail, eliminating invasive species, collecting samples, and tincturing scents (tincturing = distilling fragrances with an old copper whiskey still). In a hands-on demonstration of their commitment to natural frangrance production, the trip gave a look inside Juniper Ridge’s process, mentality, and the making of their newest release, Winter Redwood. Day One is below, and Day Two follows. To get your own Winter Redwood, click here. Obi Kaufmann, the Chief Storyteller and guide for our fragrance expedition, signs his title, “Camp Counselor.” And with the hour-by-hour itinerary and the exhaustive packing supply list, it seems a bit like going to camp. At this point I’ve got the pre-teen anxiety of being the pawn whose never been in the woods. Obi—he’s the king of the mountain. At 11:54AM, we assemble for our first activity—a group photo. Everyone curves their beard to a smile (there’s four full beards, one budding beard, and four with heavy scruff). I’m in Carhartt khaki shorts and a tee. I smile wide. At the trail head small pull-string pouches are handed out, printed with the Juniper Ridge label. “I invite you,” Obi prefaces, “to preserve your own wilderness souvenir.” We all nod and pocket the pouches. Then Hall breaks off path. To understand Juniper Ridge is to understand the eccentricities of Hall. The Marin Range mountains are his backyard—and his playground. He’s been giving tours of this area for decades, and yet, as we hop off the trail and into some light brush (California sage), he’s excessively enthusiastic, like it’s his first time in the woods. Twenty yards down the path we’re creating—a zigzag descending a side ravine—Hall stops. He gets serious. He begins a short manifesto for non-path routes, centered on the elevated and necessary purpose of spotting and eradicating invasive species, which often go overlooked in the less trodden areas of the mountain. Hall talks about native species like they’re family. “I’m here to take care of them,” he says, "if they get ignored, they get destroyed.” Invasive plants raid environments and change the ecology. They warp centuries of ecosystem development to fit their needs, and they driving out the less virile plants who’ve enjoyed the harmony of symbiotic happiness caused by a slow evolution. Beyond bottling the scents of the Coast, Hall’s also working to preserve the West the way it’s always been. He’s adamant about conserving this wilderness, and you can see this bubbling up as his primary passion. Juniper Ridge works with the Park Service to collect trees that are thinned, never taking more than is needed. It’s a natural way of working with the ecosystem, and in a world bent on profit at any cost, these guys, I’m convinced, aren’t. “It’s for the forest’s health,” Hall says, and if tomorrow they discovered what they were doing wasn’t good for the forest, I believe they’d stop, pack up shop, and call it done. But for now—and for the foreseable centuries—what's good for Mount Tam is good for business. Obi redirects to the fragrance making. “Take some cone tips, and put them in your water bottle.” We obey—a base level flavor infusion. Tom Accettola, the Field Lab Director at Juniper Ridge, grabs some freshly felled Douglas Fir. He turns to Obi: “We can tincture these.” He pulls out a switchblade, cuts a branch, and so begins the day of wilderness perfuming. “It’s all about getting the goo out of the plant,” Hall says as he hands around a branch. There’s pimples of sap spiraling. It rises up the tree in the cambium, the layer just under the bark. “Pop it,” Hall says. I pinch one between my fingers. A clear, viscous fluid forms on my nail. Hall’s dabbing the sap on his neck and wrists. “That’s perfume the way the Roman’s wore it. That’s real perfume.” It smells fresh, green, light, herbacious—it's an enticing slice of nature. It’s pretty intoxicating how genuinely interested in plants these guys are. They’re not faking it. If there wasn’t a crowd of guests surrounding them, I suspect what they’d really want to be doing—what they would be doing—is this same exact stuff. It’s not forced. They’re just doing what they love. After lunch we pull up a patch of licorice plant (the helichrysum, from South Africa) that Hall spotted before lunch. We roll the weedy clump down the hillside, then hike back to the path, reconvene at the trail head, and drive down to Steep Ravine cabins. The Juniper Ridge Field Lab van is perched above the cabins, doors open, copper still assembled and waiting. The tincturing begins here. Before petrochemical fragrances took over the perfume industry, the status-quo of the profession were “wilderness perfumers”—men and women who took plants and natural growth, extracted the fragrance, and used it to create perfumes. As Hall put it, “they were just chasing wild things and extracting them and putting them in a bottle.” Juniper Ridge is out to reclaim that art form, and currently, they’re the only purely organic, wild harvesting, non-synthetic perfumer in the world. We walk a short path and gather some California sage from the bushes growing along the sandy cliffs. Packing them in boxes, we head back to the van, where the still is heating up. Obi announces the night’s entertainment. “Tom’s about to strip a Doug Fir with a crazy knife.” The still brings four gallons of water to a boil, then is packed with the spoils of the day—Doug Fir, Bay Laurel, Sagebrush, Usnea (a moss). The boiling water makes steam, then the steam condenses and the water and oil collects in a receptacle. After that, the water and oil separate, and Juniper Ridge gathers the oil in a jar. As the tincturing continues at the van, Scribe wine is poured and passed in tin mugs. I wander to the open fire on the grill, where Matt Cacho, the Juniper Ridge Director, is toasting french bread. In the cabin behind, cheeses and charcuterie are set out (compliments of Marin Sun Farms), and a few candles help the last of the day’s light. Picnic lights hang inside the cabin, unlit. Matt looks up from his grill. Nothing Juniper Ridge has touched so far this trip has smelled less than delicious. I ask him why he cooks. Read Day Two of our trip with Juniper Ridge. Images ©Huckberry. By Jeff Masamori.